½ cup Carrot and French beans pieces. Puree of 2 medium Tomato. 1) In a deep sauce pan boil 2½ cup water. Add ½ tbsp Oil and ½ tbsp Salt. Then add 1 Cup Basmati Rice. Let it cook on Medium heat. Cover with lid for few minutes. Do not cook rice completely. Let it be uncooked slightly. Drain and transfer rice to a flat plate for cooling. 2) Cook vegetables. Do not overcook them, Keep them uncooked slightly. 3) Heat a nonstick pan; add 2-3 tbsp oil and Onion, Cashew nuts, Ginger-Garlic Paste. Sauté for 2 minutes on medium heat. Then add Tomato Puree, ½ tsp Red Chili Powder, ½ tsp Turmeric Powder. Cover and cook for 2-3 minutes. Then add Yogurt, Biryani masala and mix well. Then add cooked vegetables and very little salt. Let it cook for few minutes. 4) In other pan spread rice and make a layer. Then make layer of gravy. Again make Rice Layer followed by layer of Gravy. Make 3-4 more layers like this. 5) Pour ½ cup milk over the surface. Cover pan with lid and let it cook for 10-12 minutes. Keep the heat on medium. 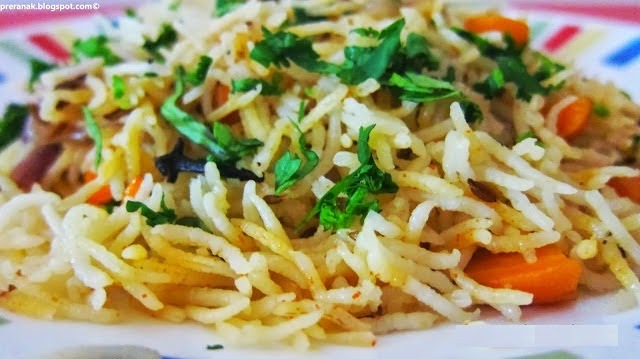 Once Biryani is ready, drizzle Ghee over Biryani to enhance richness. Freshly chopped coriander(Cilantro) Leaves : for garnishing. • In pressure cooker on a medium flame heat some ghee and add cumin seeds to it. • Let it heat and add cloves and bay leaf . • Now add sliced onions and let them get golden brown in color. 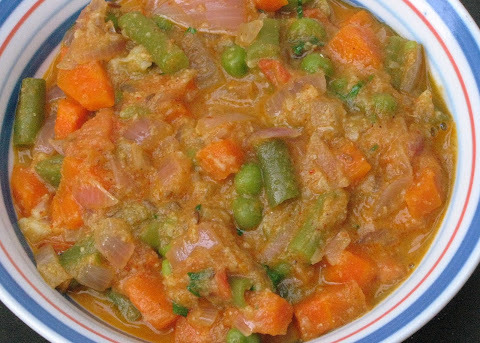 Add all vegetables i.e carrots,green peas .Keep on stirring and let them cook for a while. 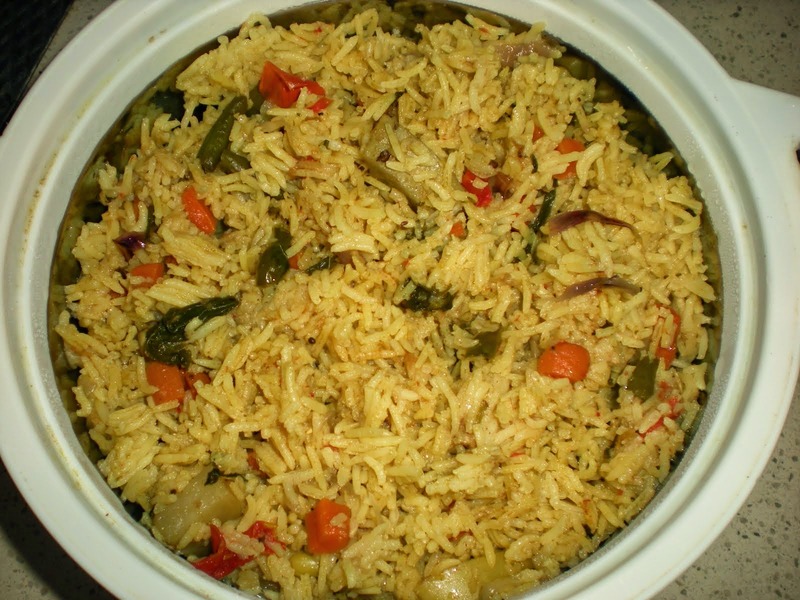 • Add cashew nuts and rice to it and continuously keep on stirring everything for a while. • Add red chili powder, coriander powder and garam masala to the rice. • Add water double to the quantity of the rice. • Close the lid and let it pressure cook till 1 whistle on medium flame. • Turn off the heat and let it cool down. • Garnish with some freshly chopped coriander leave and serve hot with some yogurt raita or butter milk. 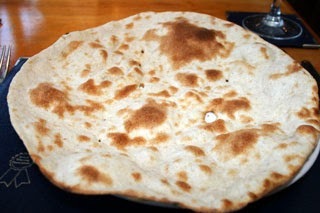 1) Knead the dough of regular roti. Keep it a little sticky. 2) Heat a thoroughly scrubbed tawa (or cooker) on high flame. 3) Roll oval shaped (just for effect, in any shape they will taste equally good :) ) rotis using as little flour as possible. 4) Wet your hands and brush the roti with water. 5) Now take roti in one hand and shift it to the other hand with little pressure. keep flipping between hands 4-5 times. 6) Now carefully put the roti on tava and by applying little pressure everywhere stick it to the tawa. Sticking the roti is very important. 7) Now flip the tawa, so that roti is facing the flame. 8) Cook the roti properly and then flip the tawa to get it back to it's normal position. 9) Using a chimta (forceps) pick up the roti from the tawa, cook it directly on the flame on the other side also. 10) Apply Ghee/butter if you want to and have Garam Garam Tandoori roti with gravy of your choice. 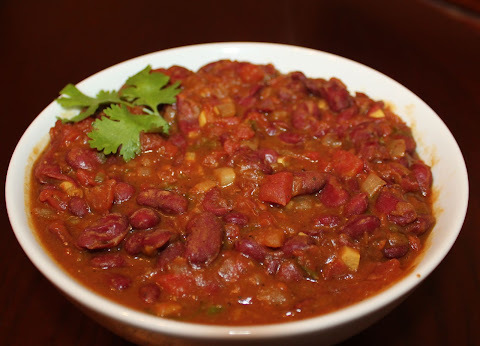 • Cook the soaked rajma in a pressure cooker for about 15 minutes. • Sauté bay leaf, cinnamon stick and cardamom pods in a little oil. • Put garlic-ginger paste to it. • Grind tomato puree, turmeric powder, coriander powder, chili powder and onion together to make a fine paste. • Add this paste to the pan and fry till oil leaves. • Mix this into the rajma. • Combine dried mango powder, garam masala powder and salt. Stir well and simmer for around ten minutes. • Heat 2 tbsp oil in a kadai. Saute ginger garlic. Add onion and fry till color changes to pink. Add red chili powder and tomato. Sprinkle some salt and cook till tomato becomes mushy. Remove kadai from heat and let this mixture cool down. Then grind to a fine puree by adding some water. • Once gravy starts boiling, add kolhapuri masala, fennel seeds powder, clove powder, cinnamon powder, cardamom powder, and salt to taste. Also, add carrots, peas and cauliflower. Cover the kadai and simmer over medium heat for atleast 10 minutes or till veggies get cooked. • Stir well and Garnish with fried cashews. Serve hot with Naan , Roti,Phulka or Chapati. • Heat the oil in a pan, add garlic, ginger and green chilles and saute for a few second. • Add the green spring onions and cook till soft. • Add the capsicum, cabbage and carrots and saute for 2 minutes on high flame. • Add the soya sauce, vinegar, red chilli sauce, salt, pepper and saute for a few second. • Add the stock and simmer for 5 to 7 minutes. • Gradually add the cornflour paste and continuously stir it, so that no lumps remain. • Simmer for further 5 minutes til the soup becomes little thick. 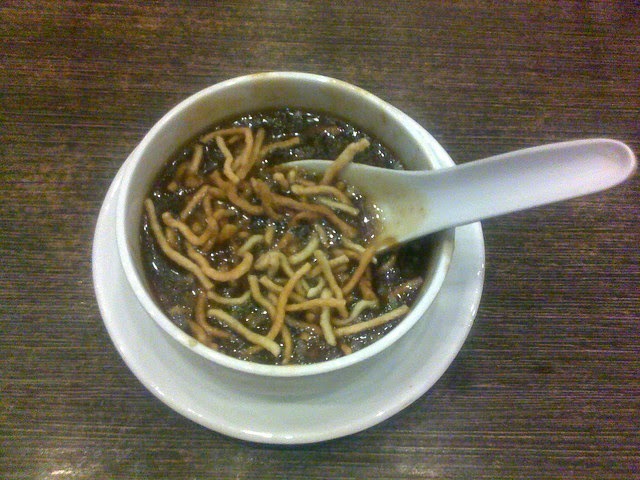 • Serve hot with Dry Fried Noddles. • Peel the potatoes and cut them into finger shaped strips. If you have a Food Processor(with an attachment for cutting finger-chips) then it will be easy for you to get equal size and shape strips. • Soak them in the water. Rub the Strips gently in the water to remove starch. Drain the water and pat dry with towel. • Heat the oil. Keep the flame between medium and high. Add some potato strips and fry until golden in color. Take them out and put them on a tissue paper. Sprinkle some salt. 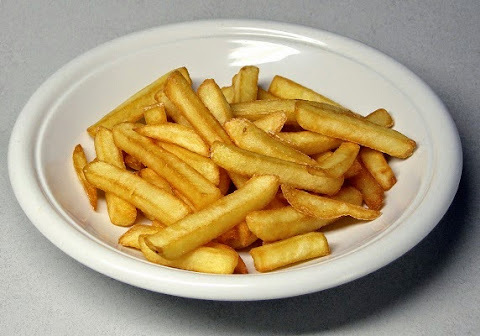 Similarly fry the remaining potato strips in batches. • Serve them Hot along with some Tomato Ketchup or Chutney. • Soak chana dal for 2 hours and put in the blender. • Add red chillies, ginger, cloves and cinnamon and grind coarsely. If needed add a little water. Make sure the mix ture is dry. • Remove the mixture in a big bowl. • Add onions, garlic, coriander, fennel seeds and salt. • For binding add rice flour and mix everything properly. • In a wok heat oil for deep frying. • Make small dumplings of this batter and deep fry them until they are golden brown. • Remove on a paper towel to soak excess oil. 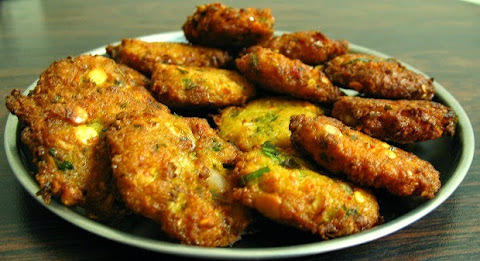 • Arrange the vadai into a serving plate and serve hot with coconut chutney.